Encrypt your email with a single click. Built by Bi101. SendSecure is email encryption at its easiest. Our technical experts at Bi101 have developed a free add-on for both Outlook and all major browsers to help more businesses encrypt their email. How does it work? SendSecure adds a single button to every outgoing message screen in Gmail or Outlook. Click it, and the message is automatically secured—that means you don’t have to type in a phrase like “Confidential” in the subject line in order to enable encryption. Why encrypt email? With cybercrime at record levels, companies need to encourage their employees to take every necessary step to protect trade secrets and prevent outside entities from snooping. Some businsess departments, such as HR, will want to ensure they’re protecting sensitive employee information, such as social security numbers. Some industries, like those that deal in patient records, might be required to encrypt messages containing sensitive information. In order to help as many of our customers as possible, we’ve build SendSecure for the most popular browsers, Chrome, Firefox, Safari, and Internet Explorer. We support multiple versions of the standalone Outlook program as well. 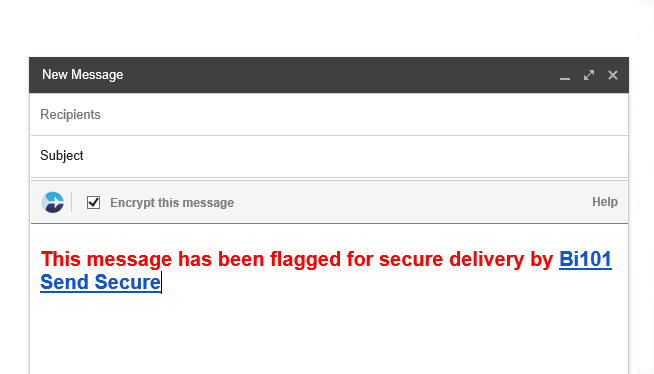 Note: SendSecure needs a separate encryption tool to function. We offer a number of possible solutions, including G Suite Google Message Encryption (GAME), Zix, Mimecast, Proofpoint, and Azure Rights Management, which is available via Office 365. Go get your download of SendSecure. Don’t have any email encryption service? Get in touch and our experts will set you up.